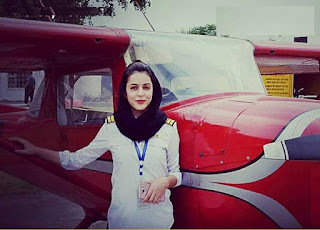 Commercial pilot, who hails from Skardu Gilgit-baltistan. Meet Amen Aamir, a 22-year old certified commercial pilot, who hails from Skardu Gilgit-baltistan. “I live in a society where only two professions are considered to be respectful – teaching and medicine. When I shared my dream of becoming a pilot with my parents, my mother was taken aback; she asked me not to think about it, but later she supported me. My father was quite happy to see me aiming for high altitudes. With my father’s untiring support, I took a step towards achieving my dream and joined a pilot training center at the age of 20. It was difficult to garner support from everyone around me since they never saw a girl flying planes – they just saw girls getting prepped up for designated gender roles. My parents didn’t cut my wings, rather they nurtured me to become what I am today. I always believed in one thing, that is, “Before you quit, remember why you started”. I wanted to fly and do something out of the box and break the stereotypes. I wanted to open doors for other girls of my region. This idea of mine always kept me motivated and didn’t let me lose hope even in days when I would feel as if I were dreaming the impossible. "The only barrier for a woman to turn her dreams into a reality is the woman herself. Nothing else can be a barrier- women just have to think big and aim for big. There’s nothing in this world that a woman cannot do. If she can bring a whole new life to the world, she can rule the world too." who hails from Skardu Gilgit-baltistan. Labels: Achievements, Commercial pilot, who hails from Skardu Gilgit-baltistan.